Double Your Credit Line - Make at least your minimum payment on time each month for the first 7 months your account is open. After you make your payments, the increase is automatic. $0 Fraud Liability – Enjoy peace of mind knowing you won’t be held responsible for unauthorized charges. Simply complete the form below to see if you match a pre-qualified offer. Checking will not affect your credit score. 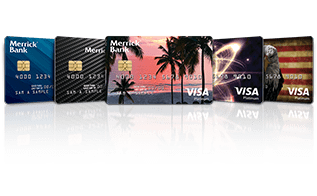 By clicking the "See if I Match" button Merrick Bank will use the information entered above to confirm your identity and try to match you to a pre-qualified firm offer of credit.